Chip and I are going to Oahu in a few weeks and this is our *draft* visual itinerary. Our first thought was splitting up our time between Oahu and Maui, but making the most out of ONE island just made more sense. And so… we’ll be exploring Waikiki and Honolulu (mainly the 4 attractions on Pearl Harbor, hiking Diamond Head crater, and a walking tour of Historic Honolulu) during the 1st half of our week, before venturing out to the other parts of the island. I’m thinking we can cover North Oahu and the top portion of East Oahu (as far south as Tropical Farms) in one day, but it may be a bit much. We’ll tour the southeastern part the following day. We have some time to finalize our plans, but this is a good start for now. As of this past weekend, we’ve decided to eighty-six the one-hour hike up to the Makapu’u Lighthouse (but will stop there for pics). 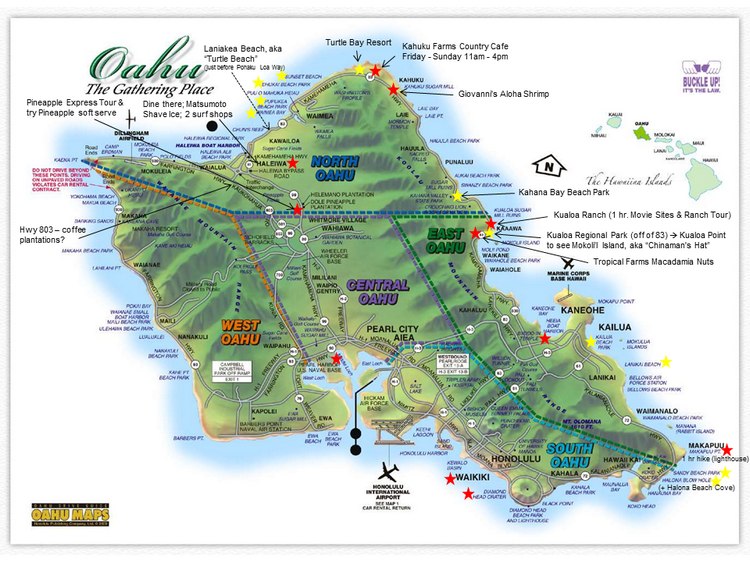 Our latest plan (outside of Honolulu/Waikiki) is going to Dole Plantation first, stopping in Haleiwa for lunch, shave ice, and seeing a couple of surf shops. We’ll then work our way towards North Shore, before continuing eastward to Kahuku for Giovanni’s Aloha Shrimp. If we somehow missed seeing coffee plantations after leaving Dole, we’ll take Highway 803 southbound on the drive back to our hotel. For the following day, our first stop will be Kahana Bay Beach Park, before taking in the hour-long Movie Sites Tour at Kualoa Ranch. I’m hoping we can catch the 11am Macadamia Nut Tour at Tropical Farms before proceeding south, and ending our adventure at Halona Beach Cove (where the love scene in “From Here to Eternity” was filmed in 1953). A good friend of mine in Maui recently mentioned eating at The Shack in Hawaii Kai, and that would perfectly cap-off our day!